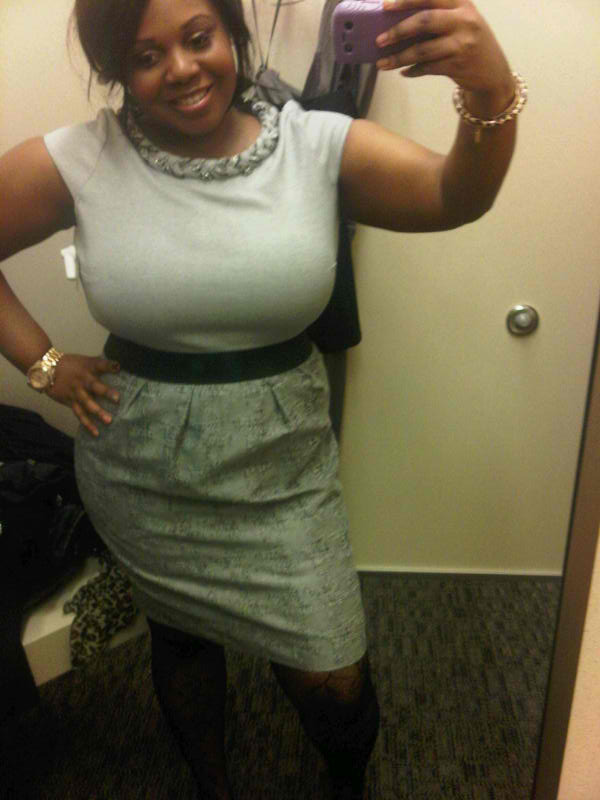 Finding an affordable semi-formal dress for a curvy/plus size body can be challenging. So after work today, I ventured out to Nordstrom’s-Off the Rack store in hopes of finding a dress that fits and under $50. I walked into the fitting room with 16 pieces. After being in there for over two hours, I checked out 4 items including the dress. MISSION COMPLETED! I was able to find an appropriate dress for the occasion. The dress is from designer, Taylor (http://www.taylordress.com/) and has the right cut and details most flattering for a curvy body: cap sleeves and a thick braided chain embellished collar; it has darts on the bust area as well as an attached stretchy elastic belt that separates the two different fabrics-solid grey color on top and stretch linen tweed-like fabric on the bottom. The belt nips me at the smallest part of my upper body giving the illusion of a smaller waist and the collar brings the attention upwards away from the tummy area. Love that dress on you. So glad you made a blog, it will probably be more simplier than uploading videos.